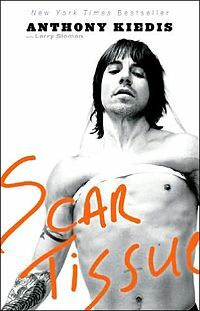 Scar Tissue is an autobiography that uncovers the incredible story of Anthony Kiedis lead singer of Red Hot Chili Peppers. From the rowdy teenage youth, to the drug addictions, to the girlfriends, to the reconciliation of band members that is now Red Hot Chili Peppers, this book has it all. His wild rock n' roller-coaster life catches you off guard with its raw unimaginable stories that could easily be within the context of a partied out rocker in his 40's, but all happens to Anthony before he reaches his 20's. A lifestyle that is not something I would have ever deciphered from his music. The book is heartbreaking, humorous, tender, alluring, real, and completely hard to put down! After reading a few pages I was already scratching to get another fix. Reading about his addictions became my addiction. Nice review, Ive hard a lot of good things about this book. I remember Scott really liked it. Oh, and welcome back from your blogosphere hiatus.